Does an idea have to be disruptive to be remarkable? Said differently, does a new concept have to shake our conventional assumptions sufficiently to the point that we must comment? Is disruption always progress? Apple released a new and enhanced line of products this week. The reviews I read focus on how disruptive the new features and design are to the consumer’s current experience. This form of disruption is deemed as positive. Consumers were generally satisfied with the current model but now the new versions offers innovation worthy disrupting our habits and considering change. 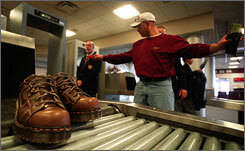 When I travel and the TSA changes a security screening procedure, disruption can be challenging. I memorize the routine as a frequent flier. I recognize that shoes are placed into a bin on the x-ray belt but suddenly they needed to be placed directly onto belt without a bin. This form of disruption is unsettling. Perhaps it leads to greater efficiency or more effective screening but it also can be frustrating. Knowing what is and what is not worthy of disruption reinforces or erodes trust and loyalty. Remarkable is not always great. If you build a tribe of followers who share a core belief they will endure disruptions as long as it enhances the organization’s dreams.